When you have superseded your old iPhone with a brand-new Android phone, next thing you could want to do is transfer files from your old iPhone to the new Android device so as to freely enjoy your new device. So here is the problem: how can you easily switch from iPhone to Android? 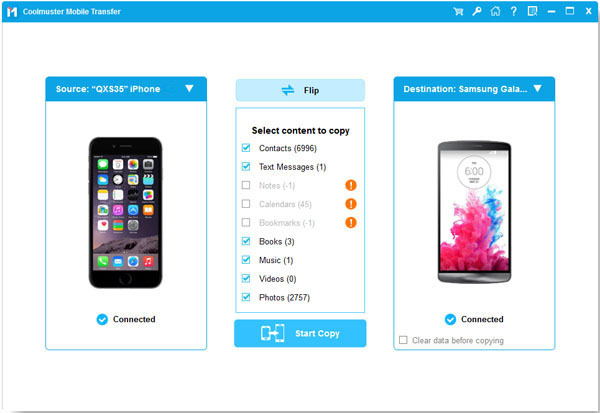 This single Coolmuster Mobile Transfer software is enough to transfer files from iPhone to Android, including contacts, messages, videos, photos and many more. More importantly, this software is fully compatible with all devices running Android and iOS systems. So you are free to sync files between two devices, no matter they are running the same or different operating systems. Below are the free trial versions of this software! If this is what you are looking for? Why not just get the free trial version to give it a try by yourself? 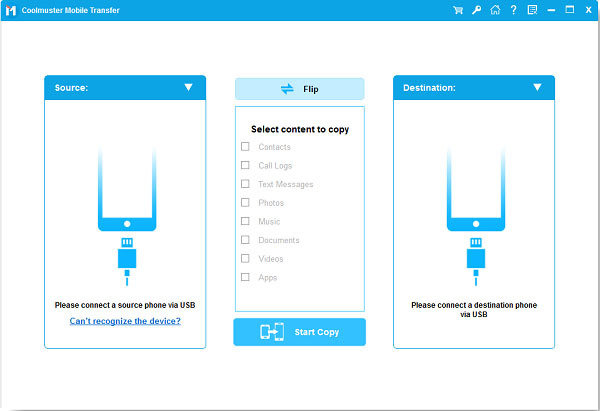 To begin with, open the installed software on the computer and then get iPhone and Android phone connected to the computer via the USB cords. Then you will see the below interface. Then you can see different file folders are arranged on the middle panel. You can click "Flip" button to change the position of these two devices if needed. While previewing, select the wanted files by ticking them out. And then click "Start Copy" button to start the transferring process. Finally, just wait for the process to get completed within a little while. All the wanted files will be successfully switched from iPhone to Android!